I’m not sure about you but my summertime mornings are pretty laid back. Lately, I’ve been mixing up my morning routine (black coffee and VH1 music videos) with homemade iced coffees and homemade treats. Last week I experimented with some old bananas and my grandmother’s Banana Bread recipe – making them in a small quantity with butter and sour cream. Her recipe was pretty dated using shortening and sour milk – and the recipe made 12 muffins (which is standard but way to many for a single girls use). This recipe just makes six standard muffins or 12 mini-muffins. I used these cute muffin cups I found at TJ Maxx many months ago…which I know is zero help to you. But, I think they are charming and add an extra element of fun. 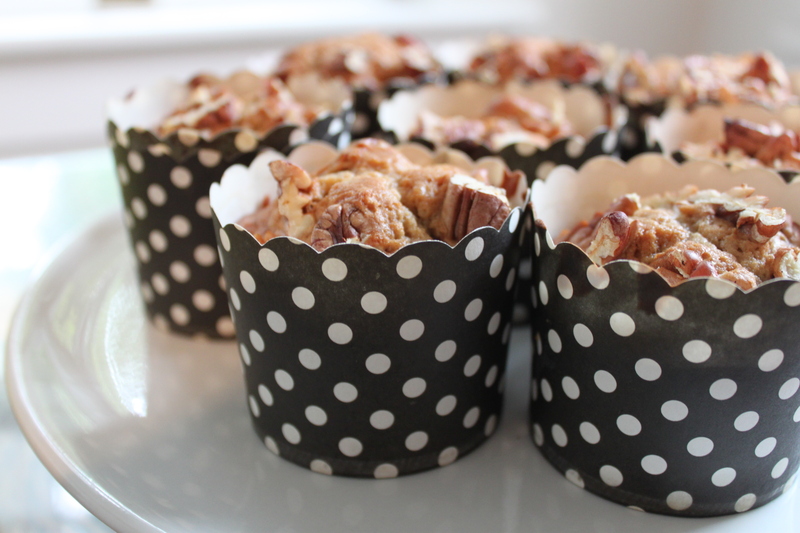 These muffins are light, full of bananas and last for a week of slow mornings at home. And. with my special guest in town this weekend, they were the perfect snack for breakfast and in-between snacks. Enjoy! Assembly: Beat together butter, vanilla, sugar and eggs. Add sifted dry ingredients while alternating with sour cream and banana. Mix until smooth. Add to loaf pan and top with chopped nuts. Bake for about an 30 to 45 (until brown!) at 350 degrees. These look great. Can’t wait to try them this weekend! Where are the cute muffin cups from?